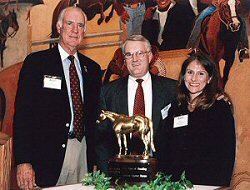 In 1999, my father, Arthur E. McKechnie, Jr. was recognized by the American Quarter Horse Association for over 50 cumulative years of breeding American Quarter Horses. Dad's longstanding dedication to the breed served as the foundation for our breeding program today. In 1947, Dad was given a Candy, a Thoroughbred mare, for a high school graduation present and bred her to Black Hawk P.1222 by San Siemon P.1810 owned by King Merritt of Federal Wyoming. Little Sug P.28,930, a brown mare was foaled thus beginning our family's breeding history of American Quarter Horses. Dad took mares to Black Hawk over the years including a Steel Dust bred mare, "Lady", and a mare purchased from King Merritt in 1947. In 1950 he leased Bourbon Tek who was by Bourbon by Ding Bob. In 1953 he bought an own son of Leo from Bud Warren, Leo Lightning. In 1960 he added Dixie Jr., son of Dixie's Paul and a full brother to Paul A, who was Oklahoma Star bred, and in 1964, a son of Sugar Bars was purchased from Bud Warren, Horatio, whose dam was Lena Horn. Dad continued with these bloodlines until 1986 and added Skip Will Win, a grandson of Blondy's Dude and 5 times bred Skipper W stallion, and Whammy Ball, a grandson of Three Bars tracing back to Little Meow and Spanish Joy. Skip Will Win and Whammy Ball continue to stand at stud. We raise horses that are functional and can work on the ranches we have owned in the Laramie Mountains of Wyoming, Arizona, and Kansas. Our horses have successfully been raced, shown in halter, reining, cutting and other AQHA performance classes. 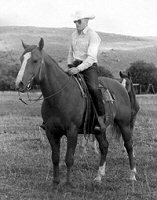 Dad's greatest achievement with his Quarter Horses was making buyers happy and enjoying the feeling he would get when they would come back a few years later for another horse for their child. Dad had repeat buyers from all over the western United States and Kristy and I are proud to be able to continue the family tradition of breeding and raising American Quarter Horses. "The Early Days of Horse Creek Ranch"
"Awards, ribbons and honors are nice, but real satisfaction comes from a parent who trusts one of our horses for their children."